‘Cities of Arabia’ has been selected as a main theme for this project. Each of the cities identified represents a major urban center in the region, and its urban fabric embodies specific historical and cultural experiences, which are expressed in its urban character and architectural expression. Conceptual design approaches are thus confronted by two main challenges. The one is how to distil the uniqueness of each of the above citied, while avoiding generalization of what one may call as the ‘Islamic Cities’ stereotype. The other challenge is hinged on the classical dilemma of all historical revitalization design approaches; namely drawing a fine line between critical interpretation, which captures the spirit of the historical fabric, and mimicking of the architectural character in building facades that are divorced from spatial logic of such language and urban order. The following section summarizes our approach to the concept design engaging the above two paradoxes. 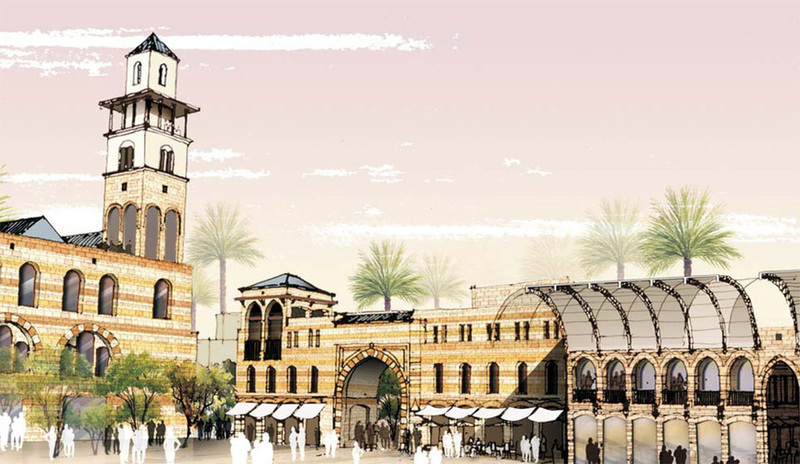 Unlike other major cities of the Arab-Islamic urban tradition, Damascus – The oldest continuously inhabited city in the world—is characterized by its unique historical layering, something that we have identified as the spirit of its urban experience. Four key patterns may exemplify this uniqueness. First is the its Roman origin exemplified in the traces of the grid and orthogonal orientation of its major urban cluster. The latter has throughout centuries of subsequent encroachment upon pubic space been transformed into an irregular pattern of urban morphology. Visitors to Damascus today cannot fail to notice this dialectic relation between the above two urban fabrics and street characters, engaging in a timeless dialogue and architectural expression. The Second key pattern is the natural and regional setting of Damascus. Located between a series of hills to the west and a network of green valleys and streams to the east, the city is strategically located in a sort of an ancient watershed, whose traces may still be experienced through the series of parks and water canals. Chiefly among the latter is the Barada River, which bounds the old city from the northern direction establishing a soft edge and a natural front. Thirdly, and not unlike many cities in the Mediterranean region, the courtyard urban type constitutes the basic spatial unit which organizes the multiple scale of the city’s functions, ranging from the smallest dwelling unit, all the way to large clusters of public institutions (khans, wikalas and religious buildings) as well as open spaces for commerce, festivities and other forms of public life. 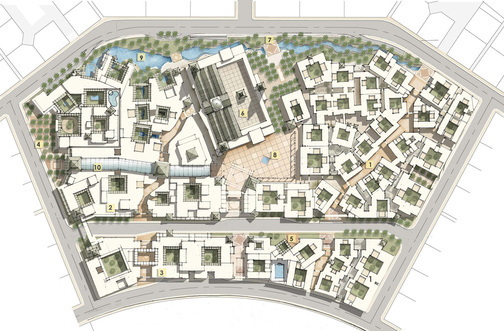 Furthermore, during the past few centuries, Damascus has developed a unique architectural type of courtyard system that spans extremely elaborate palatial houses, on the one hand, and brilliant solutions for the micro urban parcels of housing types for lower income groups, on the other. The fourth and last pattern revolves around the image and iconic character of the city through key urban monuments. Similar to other major urban centers in the region, Damascus is full of institutional buildings throughout it urban fabric, posing a serious challenge to choose few examples that are representatives of its identity. However, the Ummayid Mosque, the Citadel and the Hamidiya Suq have been identified as a prime urban pattern.